Although grating and sometimes sore, developing a cough during the flu does serve a purpose. Coughing is the body’s way of trying to reject any irritants in your respiratory system, and it can sometimes linger after many other flu symptoms have faded. 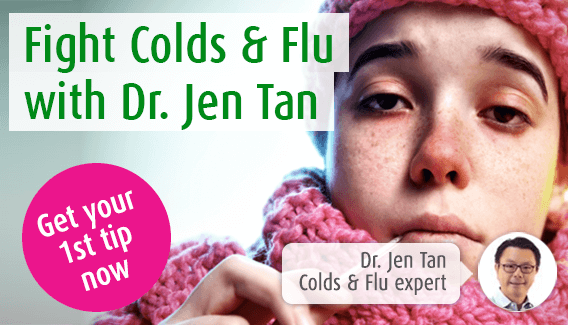 In this page, our immune system expert, Dr. Jen Tan talks about the causes of coughing during the flu, and suggests home and herbal remedies to soothe any pain or irritation. A cough is a natural reflex of your body to free itself from an irritant in your airways. Coughs can be dry and tickly, or chesty and productive- that is they produce mucus when you cough. They can develop with other symptoms at the early stages of flu or come at the end when symptoms are subsiding. In addition, some people find that their cough lingers long after all other symptoms have cleared. Why do I cough with the flu? A cough is your body’s natural way of clearing your respiratory system from irritation. When you have the flu, your body traps the virus by producing thick sticky mucus in your airways. You then cough, and expel this mucus, plus the trapped virus from the body. This is likely to cause a productive mucous cough. A dry cough occurs because of an irritation at the back of your throat. This usually happens because the viral infection leads to inflammation but can also occur if your throat becomes too dry, which is more likely if you have become dehydrated. Are there home remedies to help me? The type of remedy which will work for you will depend on the type of cough you have. For example, a mucous cough can be treated by inhaling menthol-based preparations to help loosen the mucus which is causing the cough. A dry cough is better treated with moisturising or soothing preparations, such as honey and lemon. These also have anti-bacterial and anti-inflammatory properties. It is worth avoiding dry or smoky environments, as this will cause further irritation to your respiratory tract. However, whichever type of cough you experience, it is important to keep hydrated, by drinking plenty of water or non-alcoholic drinks. This will help to thin the mucus causing a productive cough, and hydrate the mouth and throat, easing a dry or tickly cough. If your cough has stemmed from the flu, then taking Echinacea, a plant renowned for strengthening the immune system, and helping you fight off infections more quickly, may be the best way forward. Fresh extracts of this herb can be found in Echinaforce Echinacea tincture or tablets. However, if you are looking for a herbal cough syrup, then Bronchosan for dry and tickly coughs, containing fresh extracts of pine shoots, and Bronchoforce for chesty coughs with combined extracts of ivy and thyme, will be effective remedies. Are there conventional medicines to help? Many people visit their doctors with the specific hope that antibiotics can be prescribed to help their cough. However, if the cough has been caused by the flu, it is likely that anti-biotics will have no effect, as they are only active against bacteria. However, in some cases anti-viral drugs, primarily Oseltamivir and Zanamivir, may be deemed appropriate. It is important to discuss the potential side-effects of these drugs with your doctor. If you are looking for a cough syrup, then your pharmacist will be able to advise an appropriate medicine for you, available over-the-counter. Any cough of unknown cause, or one which has lasted for more than a couple of weeks should be checked by your doctor. This is of particular importance if you begin to cough up blood, are wheezing or finding it difficult to breathe.